In Xishuangbanna, land degradation has become a social, environmental, ecological, and human health-related issue due to the habitat or territorial competition between natural vegetation and industrial tree plantations. A combined planting pattern of rubber and interplanting or rubber-based agroforestry system could provide an important method to promote the sustainable development of agriculture and the environment in rubber plantations. However, few studies have examined the soil physico-chemical properties (which were commonly considered as indicators of forest soil quality) and their related interactions in rubber-based agroforest systems. Prof. LIU Wenjie and his team of Xishuangbanna Tropical Botanical Garden (XTBG) conducted a study to examine the impacts of soil quality after the conversion of natural tropical rainforest to rubber monoculture. They aimed to understand how rubber trees benefit from intercropping, especially in terms of improvement in the physical and chemical properties. The researchers selected natural tropical rainforest and rubber monoculture or comparison, and two promising agroforestry systems, rubber–coca and rubber- Flemingia macrophylla, a traditional Chinese medicine with various therapeutic purposes, as observation groups. They measured the soil total C, N, P, K, Ca and Mg chemical properties to determine the changes in soil nutrients between different land uses. They also measured soil structure, soil water capacities, soil aggregate stability and hydraulic conductivity to compare the land use differences in soil physical properties. When compared with tropical rainforest, the rubber monoculture had poor soil physical properties, poor soil structure, limited soil moisture, unstable aggregates, depleted nutrients and serious soil erosion. However, agroforestry practices of more than 10 years evidently improved the quality of soils from rubber monoculture. Rubber-based agroforestry systems significantly improved the soil physical properties and water conservancy and optimized the soil structure compared with rubber monoculture. The study entitled “Can intercropping with the cash crop help improve the soil physico-chemical properties of rubber plantations?” has been published in Geoderma. 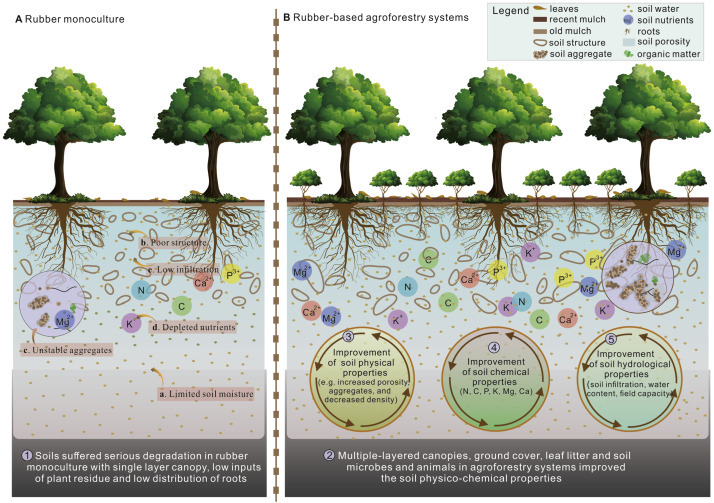 Schematic diagram illustrating the effect of rubber-based agroforestry on soil physico-chemical properties of rubber plantation.